The Province of Southern Leyte will be celebrating its 54th Founding Anniversary this coming July 1. So far the only reportable highlight that came into my radar is the apparent proposal to change the name of the province into “Leyte del Sur” – a debatable slash stupid move for a place that sorely lacks identity and exposure. However let me treat you guys into something that put Southern Leyte in the World Map dating back to the dawn of the Spanish occupation: Limasawa Island. My Adventure Map of Limasawa! I drew it, promise! I came, I saw, I conquered and I fell in love (bisan wala mangchicks hehe). No traveler is an island, thus to an island is where travelers go. Limasawa is just too perfect to pass up and it’s so near my home. Where was I all these years? (wala ko nangchicks ha!). Deymn, so little has been written about Limasawa so I decided to write a trilogy about the island myself on my blog: Limasawa Island and The King of Summer and Limasawa: An Outsider’s Guide to Paradise. I’m still working on the finale because it will be a socio-political/historical essay on the island (I still need more research). But to be really honest, what’s really out there in Limasawa Island ? Limasawa is History – There’s a quote in The Lord of the Rings “There are things that should not have been forgotten were lost. History became legend. Legend became myth.” This should not be the case for Limasawa (lol anong koneksyon?). This Island holds the claim of being the Cradle of Christianity in Asia, this is where lolo Ferdinand Magellan first made friends with the natives to the point of making a blood compact (Sandugo) with the island’s unnamed legendary chieftain, Rajah Bankaw, who had five wives (in local dialect Lima ug Asawa, thus the name Limasawa… mao to’y chicksboy! hahaha) and hosted the very first mass in Asia. Until this very day neighbouring islands like Homonhon Island and Butuan still contest such claims and the accuracy of the location. But until the time machine is invented, Southern Leyte will always celebrate and take pride that almost 400 years ago something really special happened in this beautiful island.. an event that paved the way for the Spanish Era. Limasawa is a Pilgrimage Site – because of the island’s rich history the local government together with the Church developed a part of the island (Brgy. Magallanes) to become a pilgrimage site who wants to visit the origins of our religion. It is where you can find the Shrine of the First Mass and just 450 steps above is the site strongly believed where Magellan planted the first cross. at the Hill where Magellan planted the cross of Christianity. Limasawa is a treasure itself – with only a total area of 6.98 square kilometers this hotdog-shaped island is relatively small but large enough for a traveler to explore their hearts desire where tranquility and beauty resides. In a weekend I managed to run the whole island on foot via the main roads, but it felt like I only got to taste a portion of it. I got lost on a trail one time, but I love I did! I was on the feet of a cliff where there’s caves and rock formations below. Also the local people are very nice and friendly to outsiders and tourists alike. I even made quick work on making friends with the kids and swam with them by sunset at the port. Amazing, this is the same community that survived the test of time. When Magellan landed this community is already thriving in trading as evidenced by archaeological findings and the land alone is blessed with natural resources. I want to film a short film right there. A picture of a volunteer teacher as the kids listen to her. Priceless moment. Limasawa is a great training ground – let me get you straight I did visit the island not just to see the sights, I also came there to train. And I absolutely believe I came to the right place. In the island there’s a long winding cement road from tip to tip filled with crazy uphells and downhills. For trekkers, don’t worry the other side offers incredible trail roads across the hills and its untouched wonders. One can even bring a bicycle for a fast Tour de Limasawa, man, they’ll have more time to enjoy the island. And the white sand beaches stretches for kilometers, perfect for open-water training or running barefoot by the sands! I trained there.. but end up exploring anyway. Love it when I got lost. Limasaw is a certified tourist destination – to sum all the numbers above you’ll get the mambo number five. The place is teaming with sand beaches, breathtaking views on top of hills, crystal clear blue waters, trails and landscapes just to name a few. It’s really really hard not to fall for it. But wait until you find the time to explore more of the island, to go to the fish sanctuaries, get to the underground cave, take a selfie on a lighthouse and the simple pleasure of walking around History. I came (as an athlete), I saw (as traveler), I conquered (like a king) and fell in love (like on an elusive summer romance). The island’s beauty and its undeniable historical background is a sure giveaway coming in. But I never expected I’d fall for the island’s unique charm and overwhelming sense of tranquillity, of peacefulness. 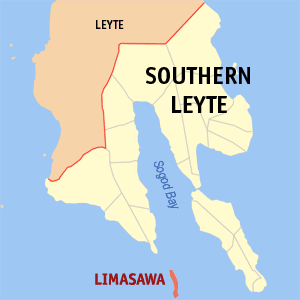 The Municipality of Limasawa is located in Southern Leyte. If you’re from Manila, ride a plane to Tacloban City. It’s OK na there. From Tacloban, ride a van to Maasin (P220), go down at the terminal and ride a bus to Padre Burgos (P30) from the port, you can ride a pump boat for P50, boat trip is at 7am and 1pm, you can charter boats though if you miss either. The trip takes 45 – 50 minutes depending on the weather. From Cebu, just ride a boat bound for Hilongos Leyte. It shold be just around P350. Then ride a bus to Maasin for P50.00. From Maasin ride a bus for Padre Burgos pier for P30. from the port, you can ride a pump boat for P50, refer on the above paragraph i fyou miss your boat. The trip takes 45 – 50 minutes depending on the weather. For reservations in Dak Dak resort you can contact Debbie at + 63 906 730 9609. Hi…What’s the scheduled trip from Limasawa back to the mainland? Hi im ley from manila looking for perfect place to relax something new this blog was really helpful and im very excited to go there good thing my father is from tacloban city…see u limasawa thanks to the blogger. “Habagat” July September – Surfing is best.. Be safe always! MAASIN Airport should operate again as it’s the fastest route to Limasawa; 4hrs max from Manila. Note: It will be the most rousing travel because in 1 Trip you can experience the 3 Transport Mode. May plano kami na pupunta sa lugar ninyo this summer i am from Ormoc…….paano ba masulitn ang vacation getaway namin sana matulungan niyo din kami…..i will be bringing my daughter na 9yrs. old and i know your place will also be educational aside ffrom beautiful sceneries. Sana, we can find place where we will be safe to stay there even for a night. is the place still friendly even for PWD person? Can you bring your own motorcycle to Limasawa Island? How much does cost for hotel there ?